DealRoom goes beyond typical deal rooms for M&A transactions. We enable teams in the finance industry to collaborate, as well as streamline internal and external workflows. From the staging period, to document collection, to closing, all the way to post-close integration, our M&A software keeps everything organized and manageable. It’s important that your data room software enables your process to run smoothly, not create inefficiencies. Why use traditional virtual data rooms (VDR), Excel Trackers, one-off emails, etc. when everything could be done on one platform? Our software is a one-stop-shop for the deal’s entire life cycle. It encourages collaboration between the management team and interested parties, allows for safe file sharing, and provides users with helpful data analytics. Best of all, we offer our intuitive data room for a one-time flat rate, instead of per page pricing. Best of all, we offer our intuitive data room for a one-time flat rate, instead of per page virtual data room pricing. DealRoom can be used for 100% of a deal’s lifecycle, not just document collection. DealRoom is 50% cheaper than traditional M&A data rooms. Traditional data rooms charge teams per page, which made sense back in the day of physical data rooms. Now it just leads to unnecessary and astronomically high invoices. Also, there are often overage fees if the deal goes over the estimated time. Data storage is inexpensive and at DealRoom we don’t think it's fair to charge per page. What is fair, is to charge a one time flat rate that includes unlimited data, unlimited users, and no overage fees. We also aim to equip our customers with not just a well working data room, but a fully capable project management tool to streamline workflows, enable collaboration, and help you and your client close deals faster. Our requests tab is one of the main differences between us and the other data room providers for Mergers and Acquisitions. Instead of relying on Excel trackers, all buyer document requests and communication regarding the due diligence process can go through the platform. Everything is updated in real time, so users no longer need to worry about version control. DealRoom supports all file types, so file uploading and sharing has never been easier, or safer. The documents tab is where all files and documents are securely stored and organized into folders. Users can access recent files and bookmark files to quickly find what they need. 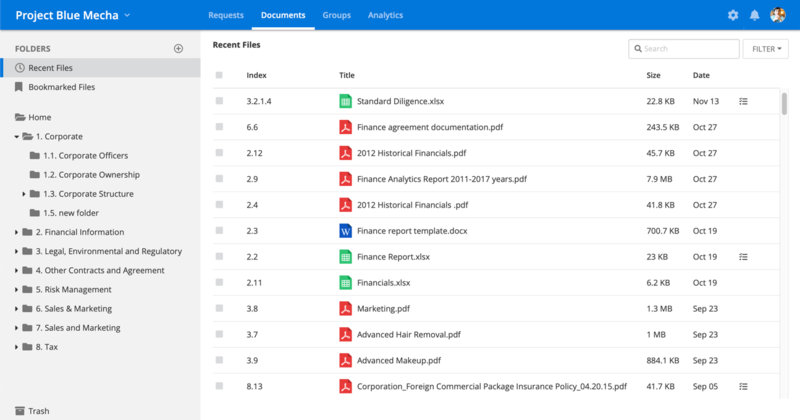 Drag and drop allows users to quickly upload, rearrange folders, and reorder the index. You can also use the smart search feature to find a file based on its title. Additionally, team members can create a new request from an open document. Our analytics tab gives users insightful and granular details about deal activity such as buyer behavior and specific document activity. 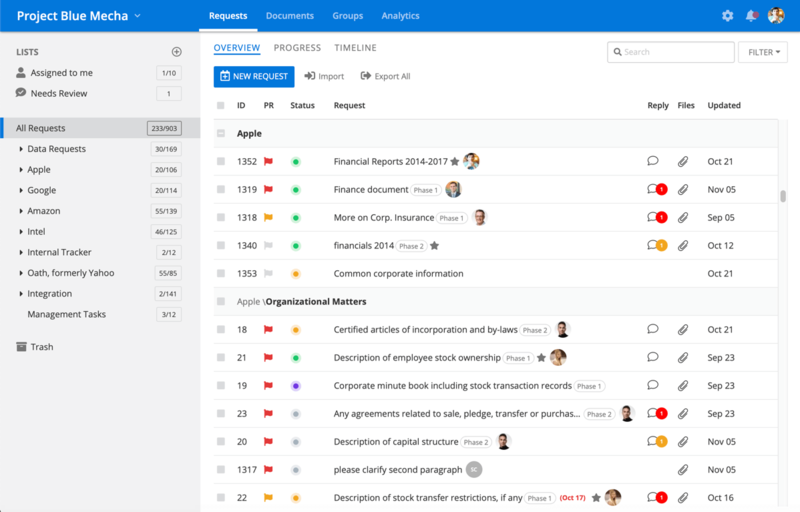 You can quickly visually track the progress of requests, documents, and user activity. All analytics are updated in real time, and reports can be spun up into an Excel or PDF with the click of a button. Additionally, the audit log tracks any and all activity within the room. 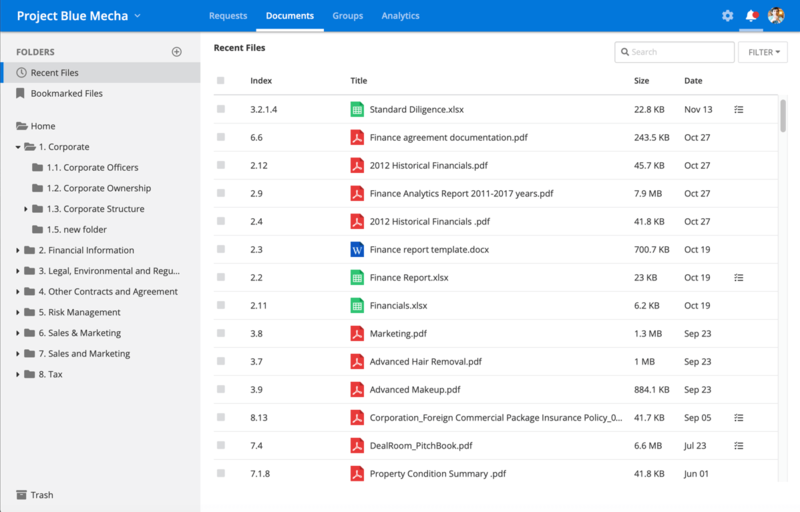 DealRoom combines project management with a full feature online data room, allowing users to create new document requests straight from the document viewer. Just like you can within the requests tab, users can assign other team members, add labels, due dates, and more. Also, whenever you add a request from a document, related requests will pop up to prevent duplicate work. Instead of sending one-off emails to ask questions, or navigating through long email threads, users can communicate and comment within the platform. The entire communication thread can easily be followed on each request by assignees, reviewers, and followers. Users, such as potential buyers, simply get a notification when a new comment has been added. Team members can quickly export a site map of the entire room, or any specific folder, to a PDF or Excel sheet. Within the PDF, users can see the breakdown of every folder and each link is a clickable live link that will take users to the file within seconds. All files and documents are updated in real time. At DealRoom, we want our customers to have more than just an exceptional data room experience. 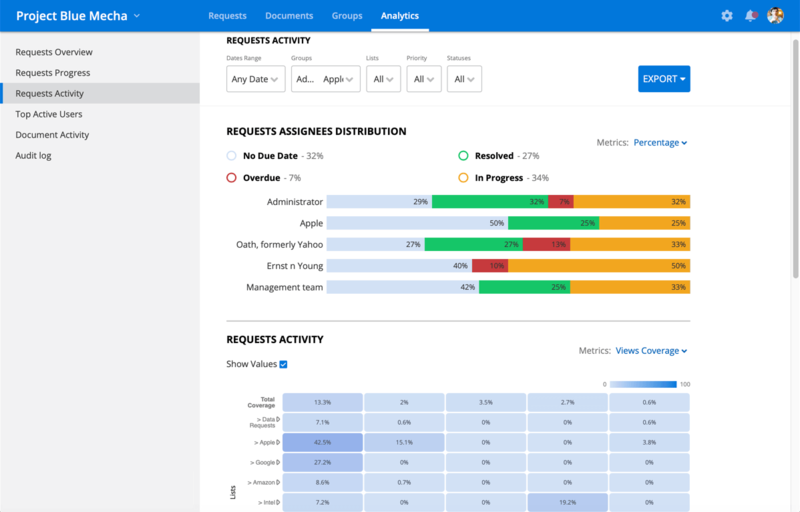 Between the requests, documents, and analytics tabs, users have access to a true project management software that prevents work silos, duplicate work, and Excel trackers. Besides it offers due diligence data room checklists for a faster room populating with requests and folders structure. DealRoom’s project management capabilities can be used for internal, deal, and pipeline management. Teams can securely collaborate, delegate responsibilities, and communicate without ever leaving the platform. Are you ready to streamline your entire process with our online data room solution? "The user interface was terrific and easy to use. I appreciated how it was easy to download files in the respective folders." Find out more about DealRoom’s pricing plans. Once you pick a plan, you can have a room up and running within minutes. No matter what size business you are, whether you are on a corporate development team, or work at an investment bank, venture capital, or private equity firm, we have a plan that will work for you. Our online platform for mergers and acquisitions includes state of the art project management technology, as well as a full feature M&A data room and a dedicated success manager. Want to find out more about DealRoom’s data room solution for mergers and acquisitions? Let’s talk!